This story has been updated with a new article. Alaska Gov-elect Mike Dunleavy’s transition team on Friday sent an email to all at-will state employees asking them to submit resignation letters and, if they choose, reapply for their jobs. The request went to a bigger group of state workers than occurred with previous incoming governors, according to Dunleavy’s transition team. “Such a move is customary when a new administration takes over, but the governor-elect has broadened the scope of which employees have been asked to take this step,” said a statement emailed by Dunleavy communications director Sarah Erkmann Ward. Broadening that scope to include all at-will state employees, rather than a smaller, more select group, “typically has not been done in the past,” she said in another email. Dunleavy, a Republican, will be sworn in on Dec. 3. At an Anchorage hotel Friday night for a separate announcement, Dunleavy told a reporter, “we look forward to talking with a whole bunch of folks" in Gov. Bill Walker’s current administration. 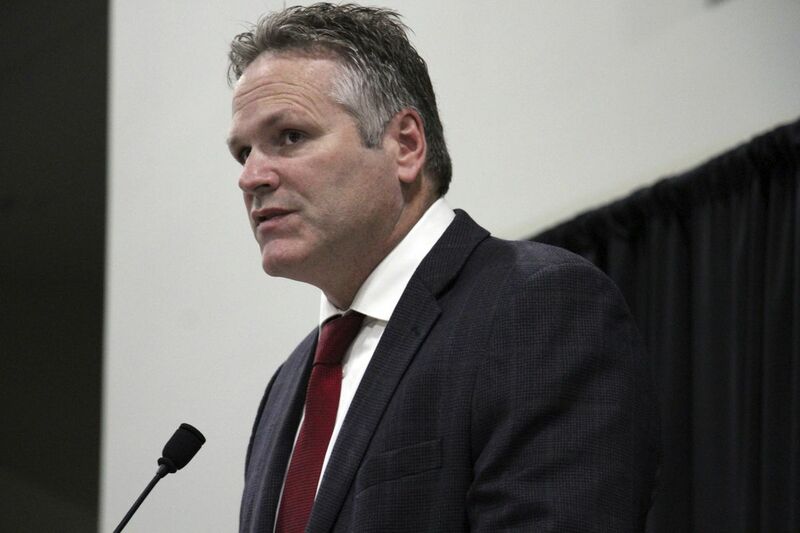 “We want to give people an opportunity to think about whether they want to remain with this administration and be able to have a conversation with us,” Dunleavy said when asked why the scope of the resignation letter request included all at-will state workers. Dunleavy’s transition chairman Tuckerman Babcock said employees are being asked to submit resignation letters, but that doesn’t mean those resignation letters are automatically accepted. The request does not affect classified employees, Babcock said. It wasn’t immediately clear how many employees were asked to resign on Friday. Babcock said he did not know the number of how many at-will employees have been asked to submit resignations. He used 400 as a number of workers that have been asked to submit letters of resignation in the past. In 2014, a transition team member for Walker also sent out a statement asking members of former Gov. Sean Parnell’s administration to submit resignation letters. That letter affected about 250 state workers, the Anchorage Daily News reported at the time. Employees have been asked to submit their resignation in writing on or before Nov. 30, according to the memo that was sent to workers on Friday. “Acceptance of your resignation will not be automatic, and consideration will be given to your statement of interest in continuing in your current or another appointment-based state position,” the memo said. The other alternative for at-will workers who don’t submit a letter of resignation is termination from the job, Babcock said. At the Crowne Plaza hotel for the Alaska Farm Bureau’s annual banquet, Dunleavy announced the appointment of Tamika Ledbetter as his commissioner of the Department of Labor and Workforce Development. Ledbetter is currently a regional manager for the agency’s Anchorage and Matanuska Susitna Valley region. She’s registered as a Republican, according to state voter registration data. Ledbetter is a veteran of the U.S. Air Force and has a doctorate degree and master’s degree from the University of Phoenix, according to information from the Dunleavy transition team. She also has a bachelor’s degree from Virginia Union University.